Ponce’s historic market square is known as Plaza del Mercado Isabel II. It was originally opened in 1863 by the then Ponce Mayor Don Luis de Quixano who proudly expressed in its inaugural address: “If only Captain Ponce de Leon, from the grave in which he rests, could lift his shrouded eyes and see the extent of what he founded”. Originally designed by architect Timoteo Luberza de San Martín and modeled after the Paris market in France, the building has been broadly remodeled many times throughout its momentous life (in 1903, 1941, 1989, and 2007). Its actual art deco facade follows the style of distinguished Puerto Rican architect Pedro Méndez Mercado, also responsible for Edificio Miami (in San Juan-1936) and Escuela Aguayo Aldea (in Caguas-1939), among his other significant works. 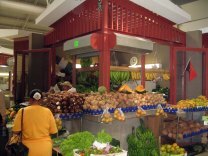 Besides fresh fruits and vegetables, visitors to Ponce’s Plaza del Mercado will find diverse local produce, traditional candies and baked goods, food kiosks, handmade cigars, handcrafts, souvenirs, even musical instruments and lottery tickets among its 65 stands or “puestos”. View the expanded version of our Ponce Map, and check the user friendly icons conveniently indicating the exact locations of all the Ponce attractions mentioned in your guide (opens in a new window).